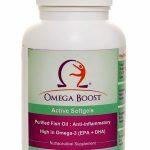 Lipomic’s Omega Boost active Soft gel is high strength Omega-3 supplement formulated for the entire family. 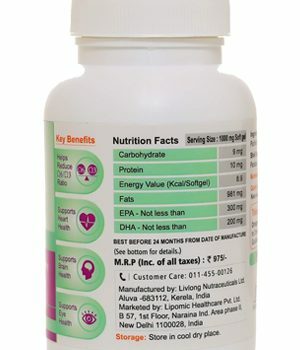 Each 1gm soft gel contains 500mg omega-3 fatty acids (Eicosapentaenoic acid and Docosahexaenoic acid) which supports brain heath, heart health and eye health and also helps in maintaining your optimum Omega-6 to Omega-3 ratio. 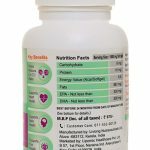 DHA: 200mg Store in cool & dry place Consult physician if using blood thinning medication. According to the European Food Safety Authority (EFSA) the optimum omega-3 intake to normalize blood pressure and triglycerides for heart care should be more than 2 g/d, preferably more than 3 g/d, providing an Omega-3 level of more than 8 % in whole blood . 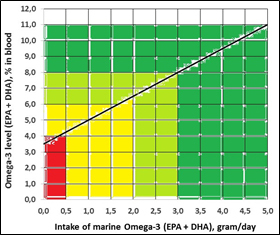 The figure shows the relationship between the recommended intake of Omega-3 (EPA+DHA) and the corresponding levels of Omega-3 in blood. For example, daily intake of 4 g/d is expected to raise the levels of Omega-3 in blood to about 9.5%. 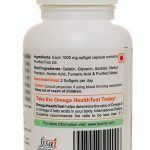 You can use the Omega HealthTest to know the level of Omega-3 fatty acids in your blood and to measure your dosage requirement as per your diet and lifestyle. 1The scientific opinion of the European Food Safety Authority (EFSA) scientific panel, EFSA Journal 2009; 7(9):1263. When it comes to fat, there’s one type you do not want to cut back on: Omega-3 Fatty acids, an essential fatty acid and the main useful fraction of fats and oils necessary for overall health. They are one of the most healing nutrients for our body. Two crucial ones are EPA and DHA, certainly found in some cold water fatty fishes (mackerel, herring, tuna, salmon, cod liver, whale blubber, and seal blubber). Alpha-Linolenic acid (ALA), another Omega-3 fatty acid found in plant sources such as nuts and seeds (walnuts, flaxseeds, etc). Not only do our bodies need Omega-3 fatty acids to function but also they deliver many big health benefits. Interestingly, our body does not produce these essential fatty acids in adequate amount; therefore, you must get them from food or supplement sources. How is Omega-3 beneficial for your Health? Some of the benefits of Omega-3 reported in scientific literature: Can Fight against Depression and Anxiety: Studies have found that people who consume Omega-3 fatty acids (especially EPA and DHA) on daily basis are less likely to be depressed . One study even found EPA to be as effective against depression as Prozac, an antidepressant drug . Improves Eye Health: Getting enough of omega-3 has been linked to a reduced risk of macular degeneration , one of the world’s leading causes of permanent eye damage and blindness . Promotes Brain Health in pregnancy and early lives: DHA accounts for 40 % of PUFAs in Brain, and 60% in the Retina of the eye . Getting enough of Omega-3 in the pregnancy is linked with numerous benefits for child including higher intelligence, better communication and social skills , less behavioral problems, decreased risk of developmental delay , and decreased risk of ADHD, Autism and Cerebral palsy . 2Gross.G et al., “Omega-3 Fatty Acids and Depression: Scientific Evidence and Biological Mechanisms”, Oxid Med Cell Longev, 2014. 3Jazayeri.S. et al., “Comparison of therapeutic effects of omega-3 fatty acid eicosapentaenoic acid and fluoxetine, separately and in combination, in major depressive disorder”, Australian and New Zealand Journal of Psychiatry, Volume 42, 2008 – Issue 3,192-193. 4BM. Merle.et al., “Circulating omega-3 Fatty acids and neovascular age-related macular degeneration”, Invest Ophthalmol Vis Sci., 2014 Mar 28;55(3):2010-9. 5LS. Lim., et al., “Age-related macular degeneration”, US National Library of Medicine National Institutes of Health, 2012 May 5;379(9827):1728-38. 6M.Singh., “Essential fatty acids, DHA and human brain”., Indian J Pediatr, 2005 Mar;72(3):239-42. 7IB. Helland. et al, “Maternal supplementation with very-long-chain n-3 fatty acids during pregnancy and lactation augments children’s IQ at 4 years of age”, US National Library of Medicine National Institutes of Health, Pediatrics. 2003 Jan;111(1):e39-44. 8MP. Judge., “Maternal consumption of a Docosahexaenoic acid-containing functional food during pregnancy: benefit for infant performance on problem-solving but not on recognition memory tasks at age 9 mo”, Am J Clin Nutr. 2007 Jun;85(6):1572-7. 9AD. Strickland., “Prevention of cerebral palsy, autism spectrum disorder, and attention deficit-hyperactivity disorder”, Med Hypotheses. 2014 May;82 (5):522-8. Are there any side effects of eating omega-3? In general, no negative side effects are noticed. Some people may notice burping on consuming any Omega-3 supplements but Lipomic’s Omega Boost Active Softgels are burp free. People taking blood thinning medications should consult their physician before consuming any Omega-3 supplements because Omega-3 has blood thinning properties. Maintaining your Omega-3 Index above 8% and your Omega-6 to Omega-3 ratio below 3:1 may also help you in quitting your blood thinners. Is there a tolerable upper limit for Omega-3 daily intake? FDA has approved consuming 3 g/day to be safe for healthy adults. However, FDA has also found no negative side effects for consuming 5 g/day of Omega-3.In 2007, an eight week study was conducted on 9 children under treatment for ADHD-primarily inattentive subtype or ADHD-combined subtype. The children were supplemented with up to 16.2 g/day of Omega-3 (EPA/DHA concentrate), resulted in significant increase in EPA and DHA, as well as a significant reduction In the AA:EPA ratio (From 20.78 ± 5.26 to 5.95 ± 7.35). A psychiatrist also reported significant improvements in their behavior (inattention, hyperactivity, opposition/defiant behavior, and conduct disorder). No serious adverse effect of high dosage O-3 supplementation were seen on ADHD children except one case of loose stools that was corrected with a lower dose . 10M Y. Wei., “Effects of eicosapentaenoic acid versus docosahexaenoic acid on serum lipids: a systematic review and meta-analysis”, Curr Atheroscler Rep, 2011 Dec;13(6):474-83. 11A P.Simopoulous., “The importance of the omega-6/omega-3 fatty acid ratio in cardiovascular disease and other chronic diseases”, Exp Biol Med (Maywood), 2008 Jun;233(6):674-88. 12T. Huang, et al., “Plasma phospholipids n-3 polyunsaturated fatty acid is associated with metabolic syndrome”, Mol Nutr Food Res, 2010 Nov;54(11):1628-35. 13S P. Huagaard et al., “Dietary intervention increases n-3 long-chain polyunsaturated fatty acids in skeletal muscle membrane phospholipids of obese subjects. Implications for insulin sensitivity”, Clin Endocrinol (Oxf). 2006 Feb;64(2):169-78. 14L L. Souza., “Effects of dietary fish oil on thyroid hormone signaling in the liver”, J Nutr Biochem. 2010 Oct;21(10):935-40. 15Sourgi. P.J., “Effects of an open-label pilot study with high dose EPA/DHA concentrates on plasma phospholipids and behavior in children with attention deficit hyperactivity disorder”, Nutritional Journal, 2007, 6:16. Can I take Omega Boost Active Softgels when I’m pregnant? Absolutely! And also during Breast Feeding. 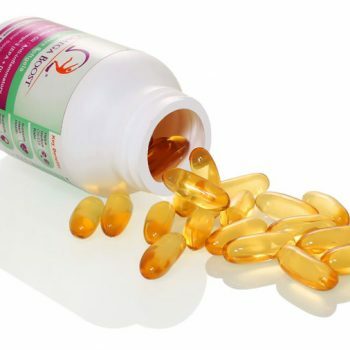 There are many benefits of taking Omega Boost active Softgels during pregnancy and lactation. 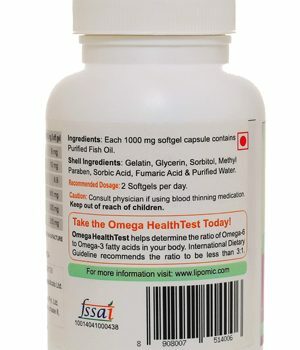 Please click here to read science backed health benefits of eating Omega-3 Softgels.You can also check your Omega-3 levels in your blood and breast milk by taking Mom’s Milk DHA HealthTest. Taking this test will let you know the exact quantity for consuming Omega-3 Softgels which will benefit you and your baby. Is Omega Boost Active Softgels good for my kids? I am already taking flaxseeds, how does consuming Omega Boost Active Softgels make difference? The main chemical constituent of Flaxseed oil (vegetarian source of Omega-3) is alpha-linoleic acid (ALA). It has been shown that the average conversion rate of ALA to other forms of omega-3 such as EPA and DHA, in our body, is about 3-4% . This translates to less than 3% EPA and DHA in RBCs which is far below the recommended levels (>8% of the total fatty acids in RBCs). Therefore, it is recommended to consume Omega-3 supplements with EPA and DHA as the main constituents. Can’t we get enough Omega-3 from the foods we eat? It is believed that the majority of Omega-3 food sources have disappeared from the modern diet. The foods that are now considered “mainstream” are often deficient in Omega-3. Even if your diet includes several meals of fish per week, you may not be ingesting sufficient amounts of Omega-3. This is because much of the fish we consume is now farm raised or does not contain significant amounts of Omega-3. Ideally, you should consume 1-2g / day of Omega-3 (DHA + EPA), either from food sources or dietary supplementation. Omega-3 fatty acids are found in deep, cold-water fish, such as salmon, mackerel and sardines. 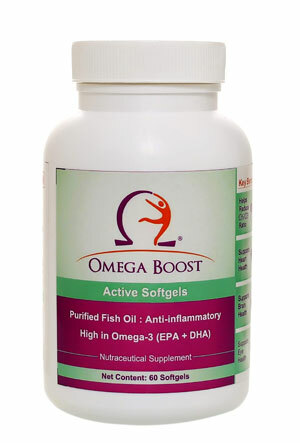 2 Softgels of Omega Boost Active Softgels provides 1g of Omega-3. 16Gerster. H., “Can adults adequately convert alpha-linolenic acid (18:3n-3) to Eicosapentaenoic acid (20:5n-3) and Docosahexaenoic acid(22:6n-3)”, Internat. J. Vit. Nutr. Res., 68(1998), 159-173.